Mathikettan Shola interior. A composite panoramic image made up of several images and then jazzed up in Nik’s Colorefex. 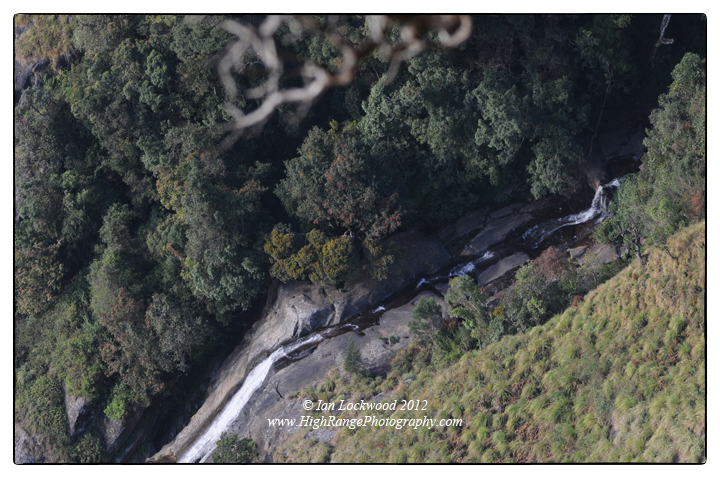 Earlier this month I had the opportunity to make a quick visit back to Kodai and the Palani Hills over a long weekend. A highlight of the trip was taking an exploratory trip with the Vattakanal Conservation Trust out towards Berijam Lake to explore Mathikettan Shola. This forest patch near Berijam Lake is significant as one of the largest contiguous sholas in the upper Palanis. The name itself is curious as it is roughly translated from Tamil as “shola where one looses oneself.” Having had first hand experience of being thoroughly lost in Mathikettan on past occasions, the name is fitting. Berijam Lake and hills looking west over expansive non-native tree plantations, as seen from the Fire Tower. Vembadi Peak (3rd highest peak in the Palani Hills) is on the far right. While Vandaravu (the highest point), Ibex Peak (2nd highest peak) and Marion Shola points are blips on the western horizon. Looking at Dr. Manfred Laun’s pictures you can see how there has been dramatic change in the Berijam lake and Mathikettan areas since the 1970s when the area’s montane grasslands were extensively planted with exotic tree species. We walked along the escarpment to the break off point of the old Berijam Ridge hike. Looking back towards the fire tower there were excellent views of mist coming up over the Mushroom Ridge. The state of grasslands here is quite precarious with wattle and eucalyptus spreading into areas that were never historically planted. Since the 1990s when I worked with the PHCC and frequently visited the area, there has been significant change and a notable decrease in the cliff-side grasslands. Bob & Tanya helped us identify a variety of flowers (see below). There are important patches of grasses surviving amongst the plantations and there is good scope for restoration work along the cliff edge. Along the way there were also numerous Rhododnederon arboreum trees in bloom with their unforgettable riot of red flowers. Mathikettan Shola itself is in fine shape with no apparent disturbance in the areas that we walked through. There was even a spray of Calanthe triplicata ground orchids in flower- unusual for a flower that usually blooms during the South West Monsoon. 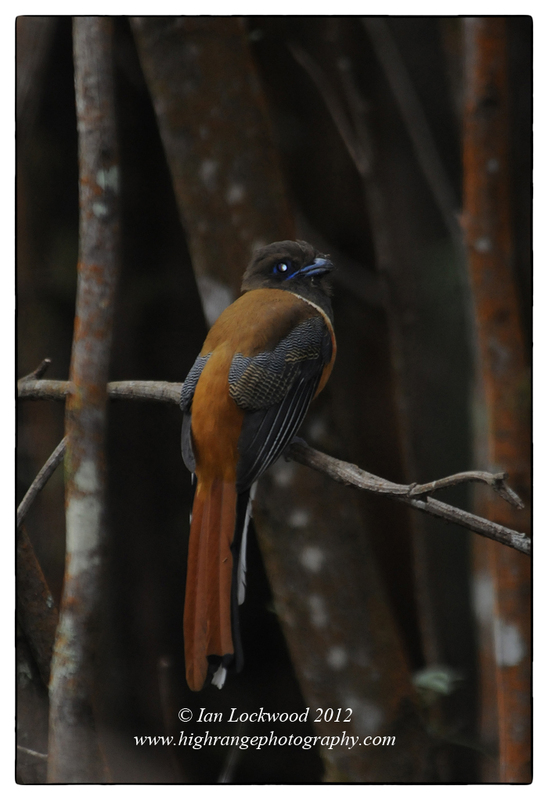 On the way back we passed through a wattle (Acacia mearnsii) thicket and were surprised (and thrilled) to encounter a female Malabar trogon (Harpactes fasciatus). 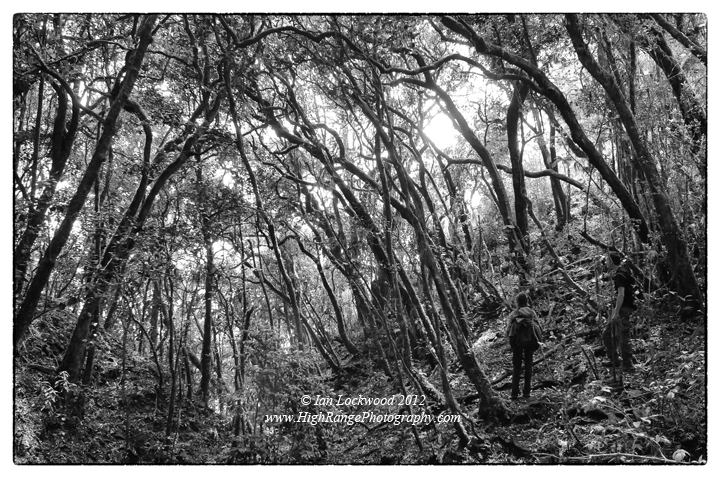 To see a lowland rainforest bird up so high (roughly 2,100 meters) and in an exotic wattle forest was very, very surprising. The plantation is right above a cliff with shola dropping to lower altitudes and it was likely just a chance encounter. There were also significant numbers of shola pioneer species (Daphniphyllum neilgherrense etc.) invading the wattle and eucalyptus forests. This seems to confirm an observed trend of shola species recolonizing non-native plantations that have taken over montane grasslands. For further information on the Berijam area look at Marcus Sherman’s writing in Wikipedia. He has done extensive research and made contributions to the Wikipedia pages on Berijam Lake and the Palani Hills etc. Mushroom Ridge on the Palanis Hills southern escarpment showing cliff, shola and mist as seen from the west. 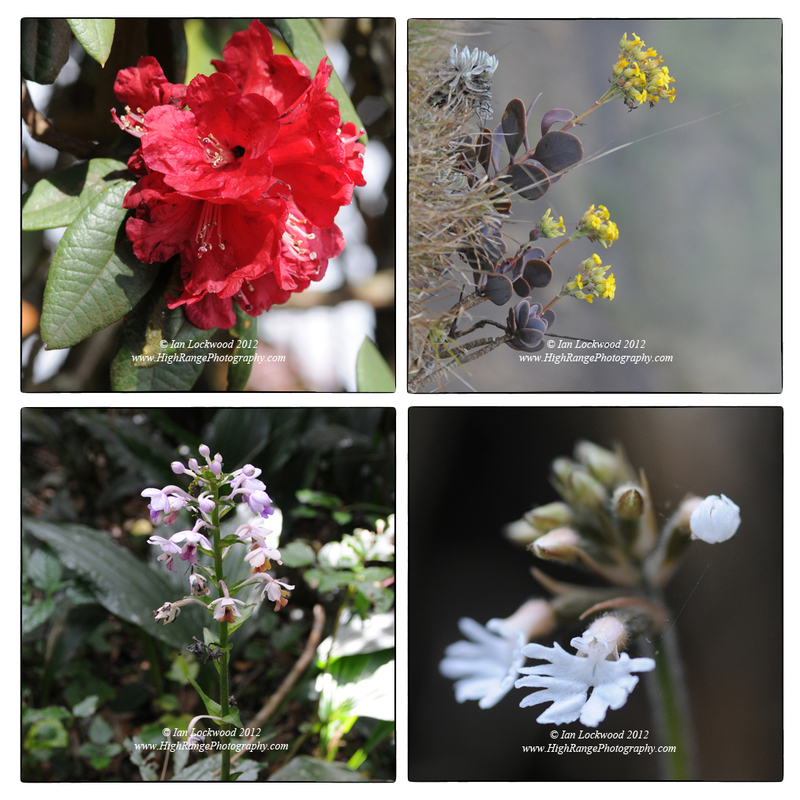 Flowers of February: From top left: Rhododenderon arboreum, Kalanchoe grandiflora and the delicate Jewel Orchid () and Calanthe triplicata. In a “sholaette” – VCT name for small sholas isolated from larger ones. This one is on the edge of the escarpment just east of Mathikettan Shola. We had waited for a grumpy gaur bull to move away before we could traverse the stream on our way towards Mathikettan. Female Malabar trogon (Harpactes fasciatus) in a wattle (Acacia mearnsii) plantation at 2,100 meters on the edge of Mathikettan Shola- a rare and baffling sighting for those familiar with the upper plateau areas of the southern Western Ghats.